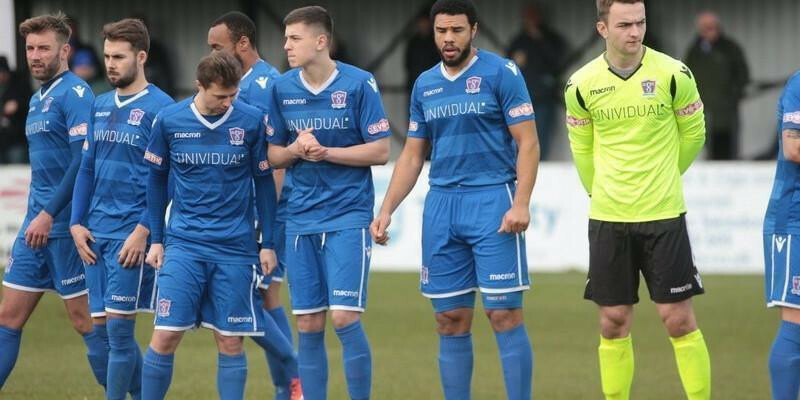 An entertaining end-to-end game at the Webbswood Stadium provided a great advert for the division as Poole Town denied Supermarine a win with a late and deserved equaliser. The visitors entered the game missing both James Constable and Luke Roberts through injury after they both came off injured in their midweek victory over Walton Casuals, whilst the hosts brought Will Henry back in goal for the suspended Martin Horsell as Ryan Campbell missed the game for personal reasons, meaning Connor Thompson pushed forward onto the wing with Dan Williamson returning at right back. Thompson was denied by the woodwork when his early curling effort from the edge of the box bounced back off the Dolphins post with Luke Cairney beaten. Jake Scrimshaw starting in place of Constable volleyed over for the visitor’s before the hosts took the lead shortly before the twenty minute mark. Henry Spalding played a delightful ball down the right hand channel to Stuart Fleetwood who took a touch past his marker to square an inviting cross to Conor McDonagh who tapped in at the far post to score his 22nd League goal of the season. Luke Cairney then made an outstanding save to deny Spalding’s curling shot from distance before Scrimshaw was off target again half way through the first half. At the start of the second half, Michael Hopkins made an excellent goal saving tackle and clearance in one movement to deny The Dolphins what looked like a sure fire goal ahead of Will Henry denying Scrimshaw with a fine save parrying the ball away to safety. Poole were starting to get a real ascendancy in the game with Marvin Brooks pulling many of the strings in the centre of the park. Brooks saw his header cleared off the line from Corby Moore’s corner and his long range effort come back off the post less than sixty seconds later as the visitors heaped the pressure on the home side in search of an equaliser. Sam Griffin dragged an effort wide, whilst Fleetwood also missed the target volleying wide and Dickson went on a solo run before pulling his effort low and wide of Henry’s near post in what had become a real spectacle of a game, with the home side looking to hit the visitors on the break at every opportunity as Poole enjoyed the lion’s share of possession. However, Marine’s defence failed to hold out for 90 minutes as Scrimshaw was finally rewarded in the 85th minute when the on-loan striker finished low past Henry from a fantastic through ball from substitute Will Spetch. Supermarine are back in action this Wednesday as they travel to Royal Wootton Bassett to play in the semi final of the Wiltshire Senior Cup versus Western League Westbury United, kick-off at 19:45, before travelling to relegation threatened Gosport Borough next Saturday.